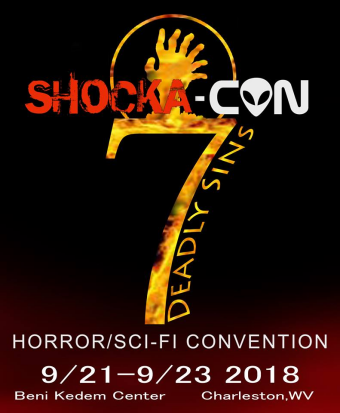 ShockaCon, West Virginia’s only horror/sci-fi convention, begins Friday, September 21, at The Beni Kedem Shrine Center on Quarrier Street in Charleston. This is the seventh year for ShockaCon, and it’s got the biggest line-up of guests so far. We’ll be tell you more about the show in the next couple of weeks, but tonight we wanted to get a head start and show you videos of past ShockaCons so that you can clear your schedule and get in the mood to kick off Halloween season in style. This year they have a stellar line-up of guests and vendors, including Scream Queen Linnea Quigley, actors Sean Patrick Flanery, Tawney Kitaen, Jyote Amge and Nicholas Bendan. Plus they’ll have artists, authors, cosplayers, after-hours music and movie screenings, Ghostbusters, Horror Trivia, drawing with Chris Woodall and more, in addition to the many vendors selling horror-themed goods and sundries. Expect to read a lot about ShockaCon in the coming days. Despite all this coolness, however, this will be the first ShockaCon that your PopCulteer will have to miss. We ran headfirst into an unavoidable schedule conflict, and I will be out of town during the show. Just because I have to miss it, that doesn’t mean that you should skip it. In fact, if they draw record numbers of attendees, and everybody posts about how much fun they’re having, I can sort of enjoy the show vicariously through other people’s posts. We begin with our coverage of the 2015 ShockaCon Costume Parade, which started at the Beni Kedem Shrine Center and wound around the first floor of The Charleston Town Center Mall. The parade is going to happen again Saturday, September 22, at 10:15 AM. You know you want to dress up and take part. One of the many highlights of ShockaCon 2015 was the Saturday night performance by Hurl Brickbat. Hurl Brickbat is: Daniel Ferrell (Drums/Vocals), Chuck Keyser (Guitar), Caleb Moore (Bass) and Christopher Carter (Vocals/Acoustic Guitar).It was really cool to capture one of the early performances by this very young band. This year Hurl Brickbat will be part of the Saturday night edition of the AfterShock show, held at The Blue Parrot on Capitol Street. You can see Hurl Brickbat below. This is just part of the music, as Friday night sees the debut of a new band, Rel X, plus performances by The Pink Flamingos and Shadow In The Moon, plus sideshow performers, and Saturday features Naughty Samadhi and The Renfields, after the main floor closes at the Beni Kedem Shrine Center. Below you see the 2014 Costume Parade. As I mentioned, this year the costume parade happens again. It’ll start in front of The Beni Kedem Shrine Center at 10:15 AM, Saturday, September 22, and proceed into The Charleston Town Center Mall. If you want to be in the parade, come in costume and be there a few minutes early. Our last video tonight features The Renfields, who will return for their seventh ShockaCon with a special performance as part of the after-hours festivities on Saturday night.